Practicing sustainability-focused design, like any art form, is a skill that requires craft and sensitivity. 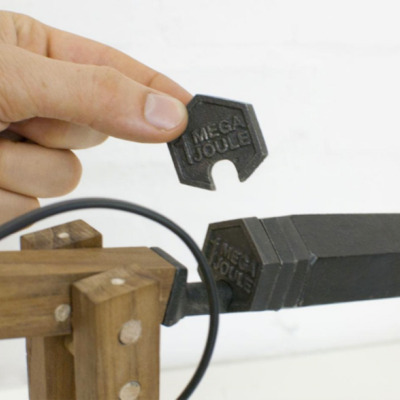 As designers, we are tasked to skillfully create consumable goods, services and systems that inevitably make an impact on many levels, many of which are not well understood or even measurable. By learning and then practicing various approaches, I have begun to understand design from a whole-systems perspective, considering both the micro and macro scale. This way of thinking has led me to consider the trade-offs—from materials to process to business strategy—that I make with every design decision. Many people think that sustainability-focused design is a burden—futile, depressing and difficult. Some don't even believe it is possible. 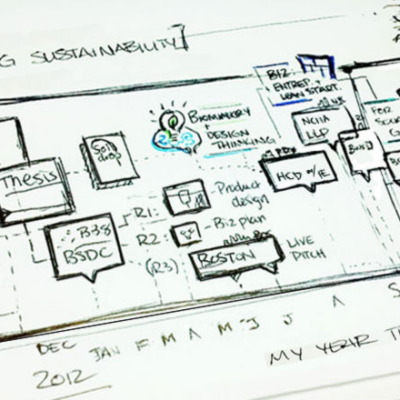 Designing with sustainable outcomes in mind may have these pitfalls but I have been able to debunk these negative opinions by studying sustainability theory and putting it into practice. To become efficient and ultimately more effective at anything, one needs to practice—a lot—and sustainability-focused design is no exception. 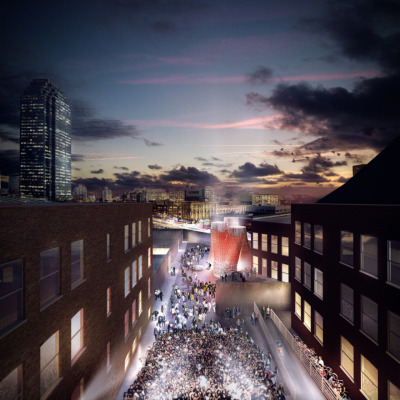 By applying comprehensive sustainability approaches to different design challenges, I have not only learned that sustainable outcomes are achievable but also that it is rewarding, both personally and professionally. As systems thinker extraordinaire Buckminster Fuller said, we must be "comprehensive anticipatory design scientists." (Fuller 1999) Comprehensive in our approaches and anticipatory in designing for problems before they happen. In addition to courses, I've found that external design competitions, such as Core77's Design for (Your) Product Lifetime Competition, are helpful platforms that challenge me to practice various approaches and anticipate design problems before they occur. 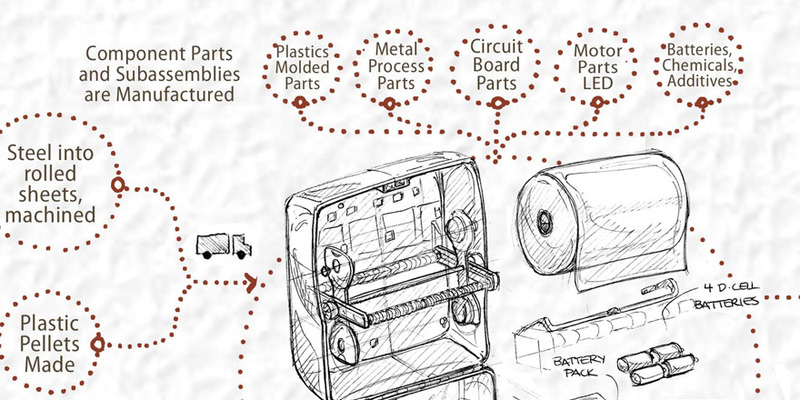 Sustainable redesign of an automatic paper towel dispenser by Stefanie Koehler. Competition entry for Core 77's Design for Your Product Lifetime challenge. Close up sections shown below. For this competition, I addressed challenges with public bathroom paper towel dispensers. Using the Whole Systems and Life-Cycle design method created for the Autodesk Sustainability Workshop, coupled with other resources such as Dan Lockton's Design with Intent Toolkit, I learned techniques for making better products and influencing ideal behaviors with my designs. While mapping out each phase in the product's life and analyzing the environmental impacts, I discovered that I had to refocus my challenge. 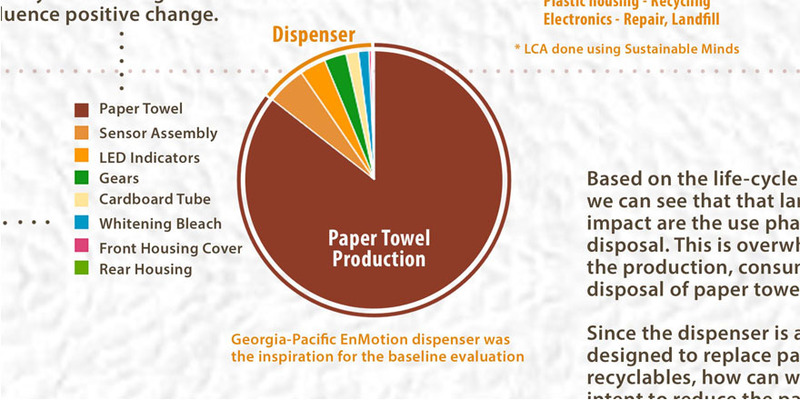 Rather than addressing the dispenser alone, I had to look at how parts along the whole system might be designed to reduce people's use of the paper towels. This led me to investigate how various environmental cues—an illustration of "perfect paper towel technique for using one sheet"; changing the layout of the bathroom—might serve to encourage sustainable behavior. 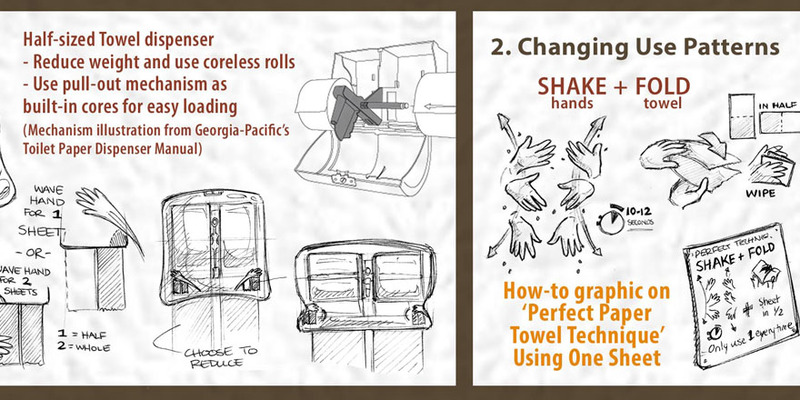 I also explored how the consumption of the towels may be reduced by using a "half-sheet" dispenser product design idea. This might leverage the same behavior pattern of grabbing multiple sheets, many of which end up being only 50% used/moistened, but that requires a bit more work and time to use a lot of paper towel. It could also reduce the frustrations expressed by custodial staff when changing out giant rolls of paper towels. Faludi expresses that in doing green redesigns, "We feel like we're succeeding in turning sustainability from a burden into an innovation tool, and making the world better one product at a time." I would go one step further to say "...making the world better one product and system at a time." If I learned anything from designing for a product's lifetime, it's that the systems (and services) that support and deliver these products are as just as important as the products themselves. 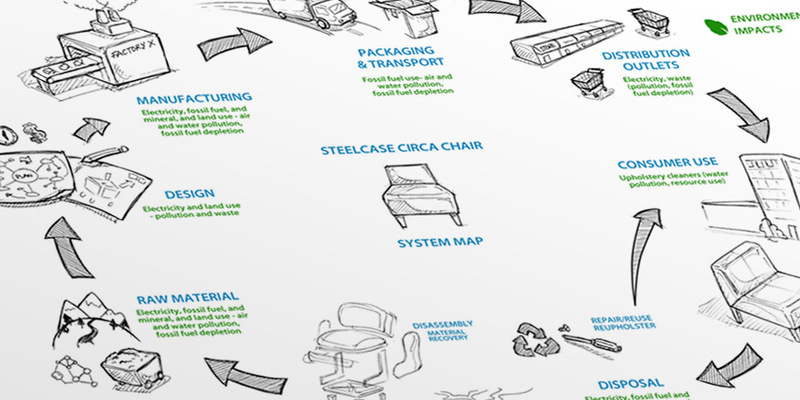 Designing products with closed loop services and circular economies in mind are key is truly sustainable solutions. 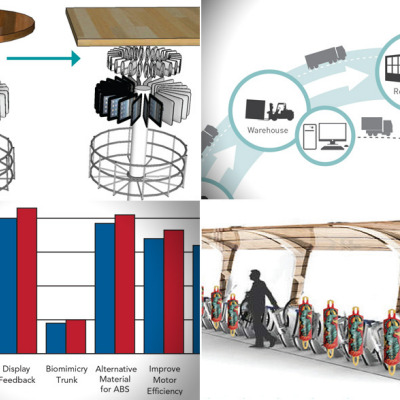 Following the Product Lifetime competition, I used the Biomimicry Student Design Challenge competition to continue practicing sustainable design for global challenges. More about this is my next article. Stay tuned!